Hi there! I am creating a fairly complex form which requires that I list my products outside of the payment tool, and then transfer the total in using the Custom Amount Payments. 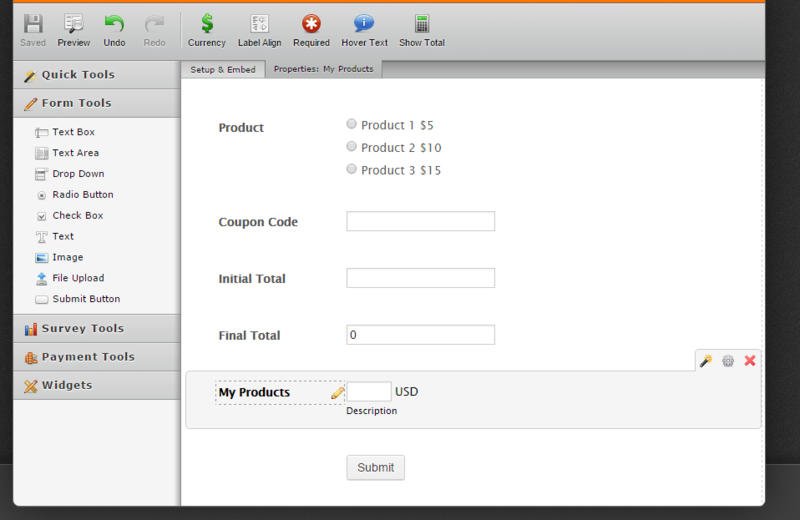 I am very surprised to find that I no longer can use the coupon feature of the payment tool. This is very unfortunate, since I was planning to have several different coupon codes for users. How can I get around this now? Apologies for the inconvenience. I believe the coupon code function is not available for custom amounts. But you can easily set this up using conditional logic. Here's a test form: https://form.jotform.com/60054771381958. Basically, we'll have an "Initial Total" field to fetch the initial values. 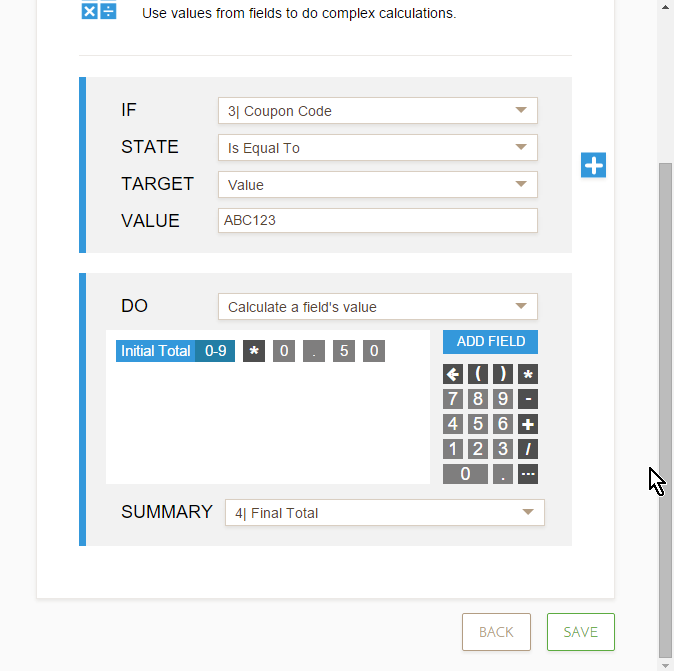 To apply a coupon code, we'll have a text box named "Coupon Code" and set conditions that will calculate the final total. 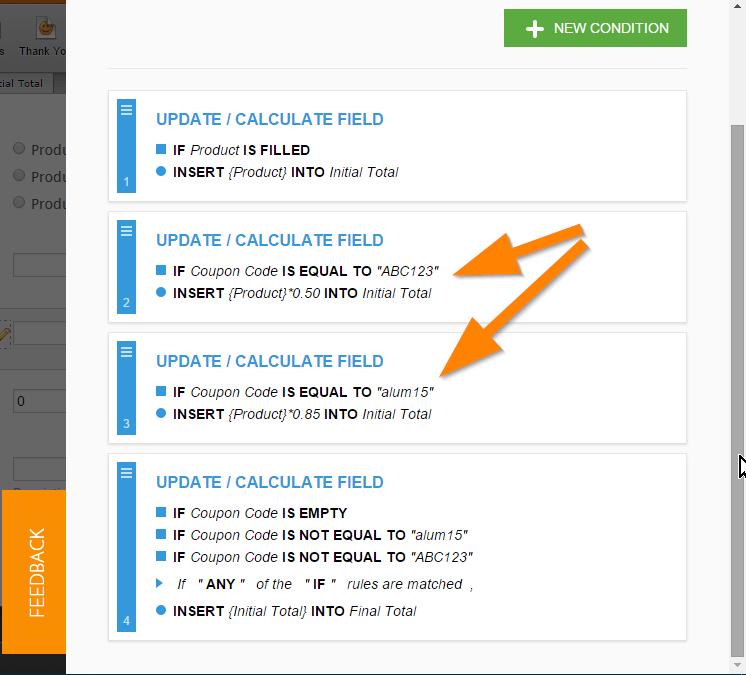 1 => The values from the radio button field will be pass on the "Initial Total"
2 => Is an example of condition that will check if the "Coupon Code" inputted is equal to "ABC123", it will deduct 50% from the "Initial Total" and pass it on the "Final Total" field. 3 => If coupon code is not equal to the coupon code setup, then pass the "Initial Total" to "Final Total" without any deductions or discounts. My coupon code "ABC123" will discount 50% on the initial total fetched from the product value. Then when I go into the form preview, and select a product, then type alum15 in the coupon code box, it does not change the total. I made some improvements, I see there was a flaw in the order. Initial Total => This is where we want the condition to happen now. Final Total => We will fetch the value from "Initial Total"
2. Here, we will directly do the calculation in the "Initial Total". "Product" value is inserted in "Initial Total"
IF Coupon Code is equal to "ABC123"
"Product" value * 0.50 and insert it to "Initial Total"
IF Coupon Code is equal to "alum15"
"Product" value * 0.85 and insert it to "Initial Total"
3. 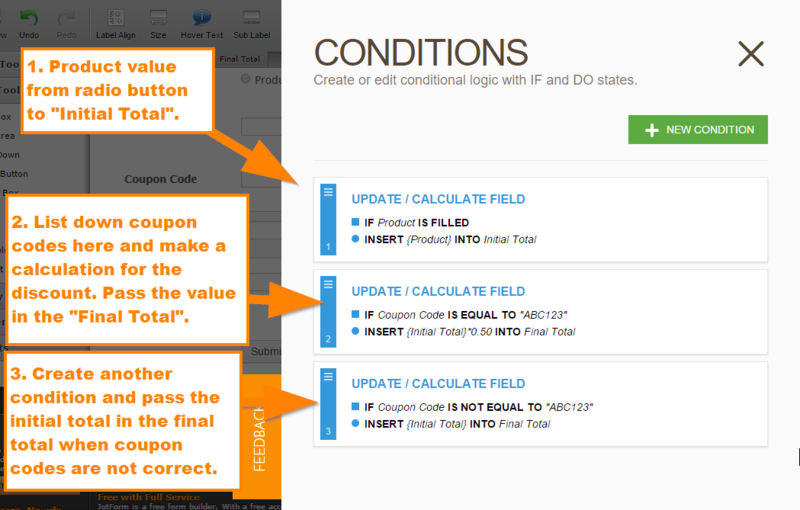 Now for every condition for a coupon code, you need to also add it in the "IS NOT EQUAL TO" condition block. What this condition does is if the coupon code is not VALID and if coupon code is empty then we will get the value of the "Initial Total" and insert it to the "Final Total".